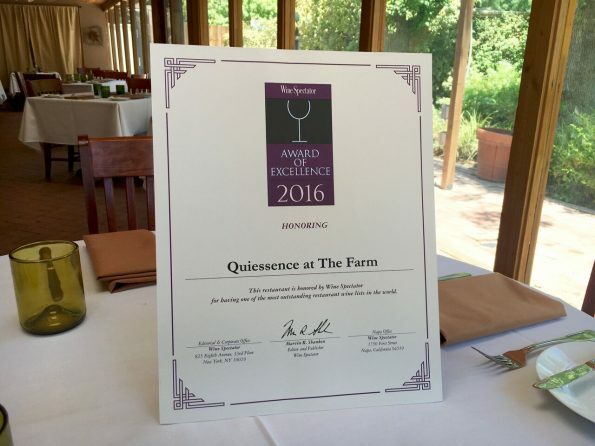 Quiessence at The Farm has been bestowed with the Award of Excellence from Wine Spectator Magazine. Wine Spectator Magazine is considered to be the industry benchmark and guide on its subject matter of all things wine. The Award of Excellence has only been awarded to a few thousand restaurants across the world. The Wine Spectator’s Restaurant Awards are judged on wine lists submitted from restaurants across the world to recognize the top programs in the industry. To be submitted, Wine Spectator requires a list to be comprised of at least 90 wine selections, contain accurate wine information, encompass vintage and appellations and wines available by the glass. After these basic requirements are met, Wine Spectator then judges for one of three awards which include the Award of Excellence, Best of Award of Excellence and the Grand Award. Other judging criteria included Wine Director Experience, Wine Strengths, Wine Selections, Pricing, Corkage, Cuisine Type and Menu Pricing. The Quiessence wine program was created by Executive Chef Dustin Christofolo. Chef Dustin is not only a graduate of The Italian Culinary Academy, Manhattan, New York, and the culinary program at La Scuola Internazionale di Cucina Italiana in Parma, Italy, but also a graduate of the Wine Immersion Program at the Culinary Institute of America, Napa Valley, California. Having a background in both culinary and wine, Chef Dustin is able to create dishes to pair with some of the best wines in the world. The wine list at Quiessence contains over 100 wines including several Arizona wineries: Arizona Stronghold Vineyards, Sand-Reckoner Vineyards, Dos Cabezas WineWorks, Merkin Vineyards, Caduceus Cellars, Page Springs Cellars and Carlson Creek Vineyard. To celebrate this prominent award, Chef Dustin will be holding a “Spectator Sips” wine dinner on Wednesday, September 28, at 6:30 pm. 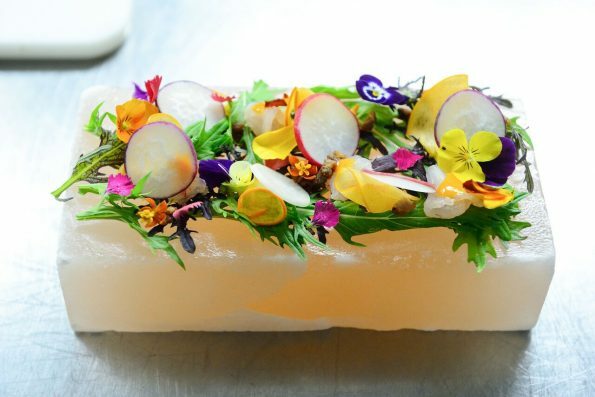 This dinner will be $89pp++, which will include four courses and will be paired with Chef Dustin’s “gem wine picks” from the award winning Quiessence wine menu. To reserve your spot, please book on Open Table or call Quiessence at 602-276-8804. To view the full Quiessence wine list please visit http://www.qatthefarm.com/savors-sips/.